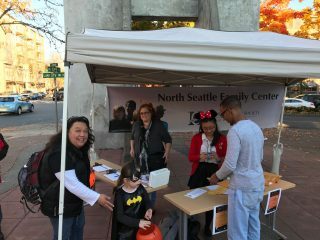 The North Seattle Family Resource Center in partnership with LCFF saw a big uptick in local business participation for the 25th Annual “Lake City Fright Night and Trick-or-Treat Walk”. 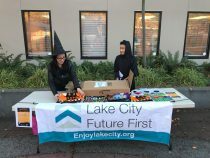 Over 30 business took part this year but the big surprise was the over 700 kids and parents that came out for the event to fill Lake City way with little princesses, pirates, witches, super heroes and beyond. It was amazing to see so much participation and to watch as the Lake City Mini Park became abuzz with families from all over the neighborhood.The Lake City Lions did another amazing job of transforming the community center into a fun filled party with pizza and treats and lots to look at. 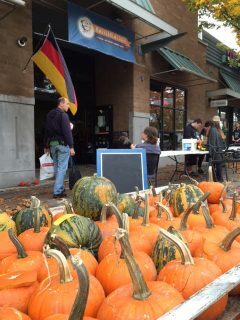 On Sunday, October 29th the fun continues with the 2nd Annual Pumpkin Palooza at the Kaffeeklatsch. LCFF again teamed up with Kaffeeklatsch, the LC Farmers Market, Hunger Intervention, North Helpline and the Watershed to bring back this fun event where we provide healthy snacks and pumpkin decorating for the kids. 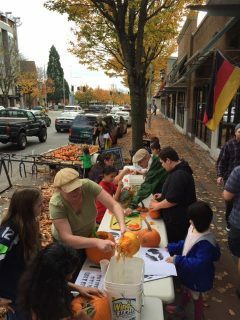 LCFF partnered with Kaffeeklatsch, Hunger Intervention, Lake City Farmers Market, the Watershed Pub, Mojito and Elliott Bay Brewery to conduct the first annual “Lake City Pumpkin Palooza”. Attendance was fantastic and the Kaffeeklatsch owners and staff did a tremendous job to put on another wonderful community event in the neighborhood. 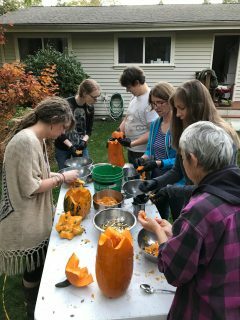 Kids of all ages came out to work their artistry and create a wonderful array of decorated pumpkins. 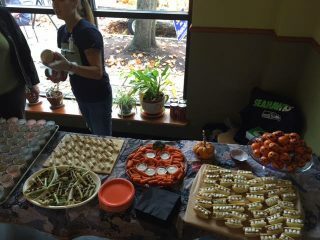 Prizes were provided by Mojito, Watershed, the Farmers Market and Elliott Bay with snacks from Hunger Intervention. Molly from the Farmers Market with here bag of tricks for decorating and enhancing the artistic expression that abounded. There were goody bags for all the little artists and prizes by age groups. LCFF was proud to supply decorating tools and the “Pumpkin Palooza Trophy” that will reside at the Kaffeeklatsch with the name of the grand champion in the adult category engraved on it. 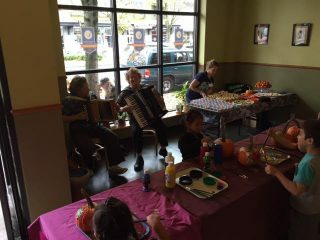 Musicians were on hand to entertain the crowd with some traditional German music courtesy of Kaffeeklatsch. We are hopeful that this event takes it’s place as another Lake City tradition. It certainly got off to a great start. Don’t miss next year and remember that it is never too early to start thinking about your winning jack-o-lantern.